Dock dog takes the plunge, the "Jungle" burns to the ground, tunnels wind through a glacier and more. 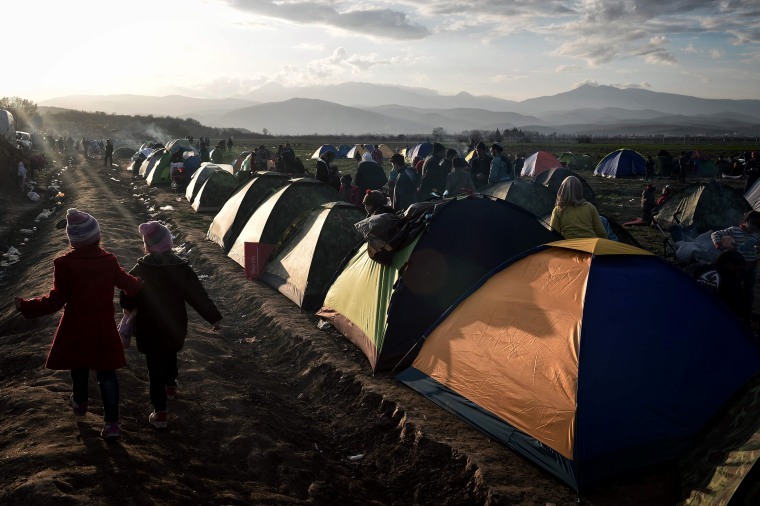 Children walk in the makeshift migrant camp at the Greek-Macedonian border, near the Greek village of Idomeni, on March 2, where thousands of people are stranded. 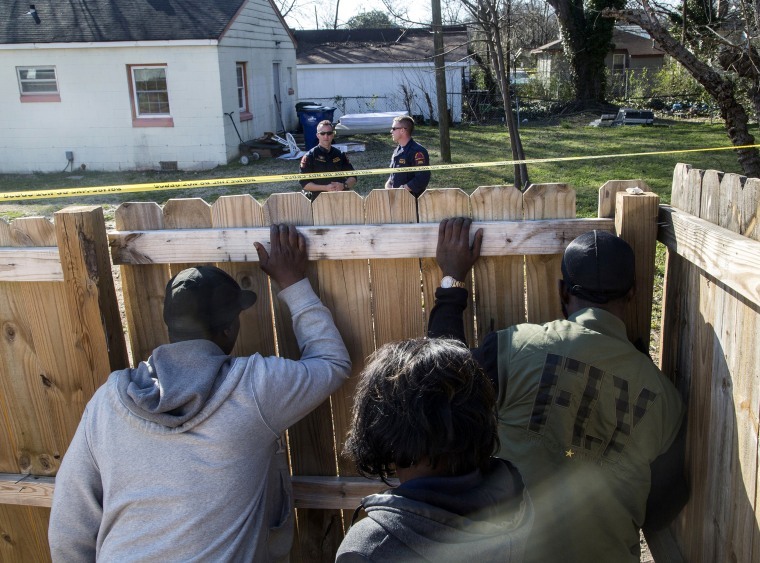 Onlookers peer through a fence as Raleigh police officers work the scene of a police-involved shooting near the intersection of Bragg and South East Streets in Raleigh, N. C. on Feb. 29. 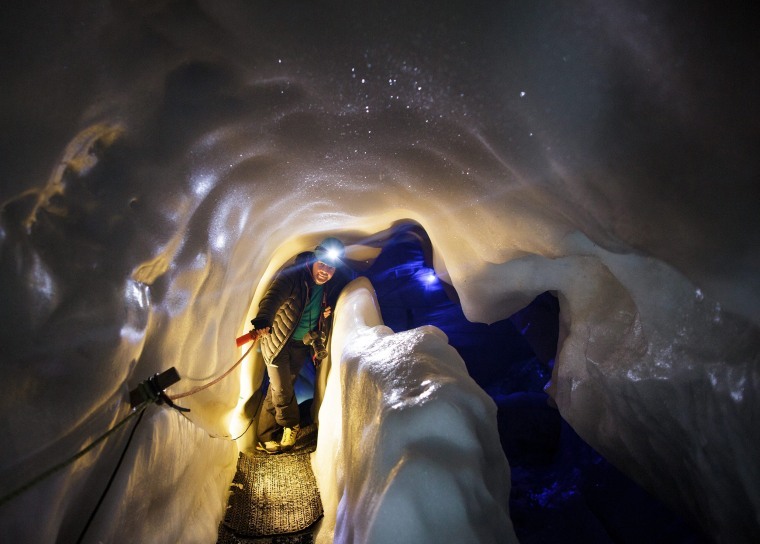 A tourist walks inside the Ice Palace glacier hollow at Hintertux glacier, more than 10,000 feet above sea level, in Zillertal, Austria on March 2. The hollow's temperature remains constant at 32 degrees Fahrenheit, in summer and winter alike, and is also used by the University of Innsbruck for scientific research projects. 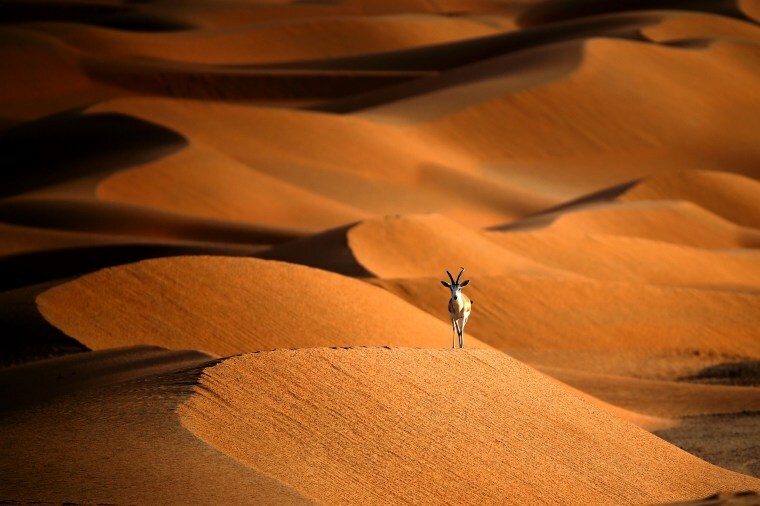 A sand gazelle is seen at the Arabian Oryx Sanctuary in Umm Al-Zamool, 180 miles south of Abu Dhabi near the Oman-Saudi Arabia border on March 1. The sanctuary stretches over an estimated 5,500 square miles and currently hosts nearly 155 Arabian Oryx which were recently reintroduced to the area as part of a five-year conservation plan. 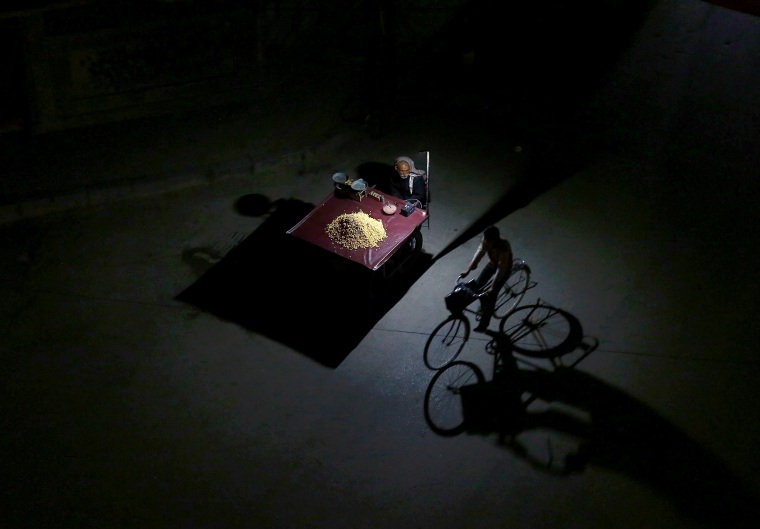 A bicyclist rides past a man selling grains during a halt in fighting on Feb. 29, in the Eastern Ghouta region, east of the Syrian capital of Damascus. A UN-backed ceasefire deal took hold across parts of Syria, bringing relative calm to areas where the Islamic State group and al-Qaeda's local affiliate are not present. 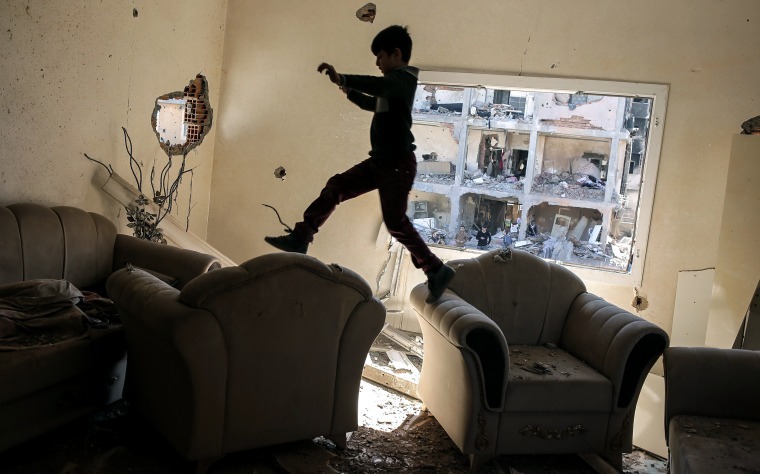 A boy jumps between sofas in his ruined house on March 2, in Cizre, Turkey. Turkish authorities scaled down a 24-hour curfew imposed on the mainly Kurdish town in southeast Turkey, nearly three weeks after declaring the successful conclusion of military operations. The curfew was lifted at 5 a.m., allowing residents to return to their conflict-stricken neighborhoods for the first time since last December. 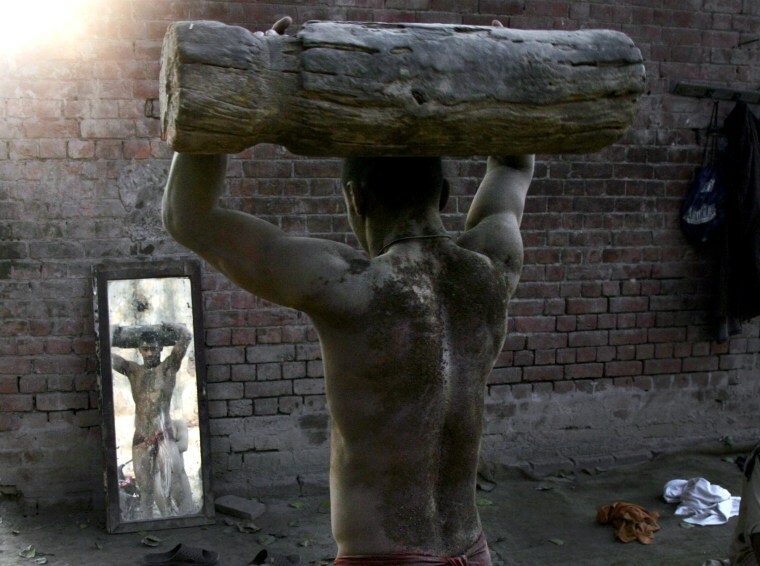 A Pakistani Kushti wrestler looks at himself in a mirror during a training session, in Lahore, Pakistan on March 2. Kushti, an Indo-Pakistani form of wrestling, is several thousand years old and is the national sport in Pakistan. 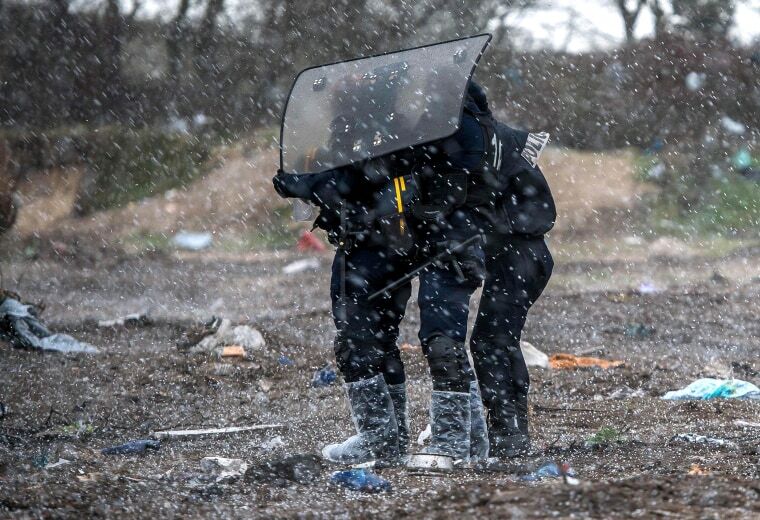 French antiriot police protect themselves from a hailstorm, during the demolition of the southern part of the so-called "Jungle" migrant camp, on March 2, in Calais, France. 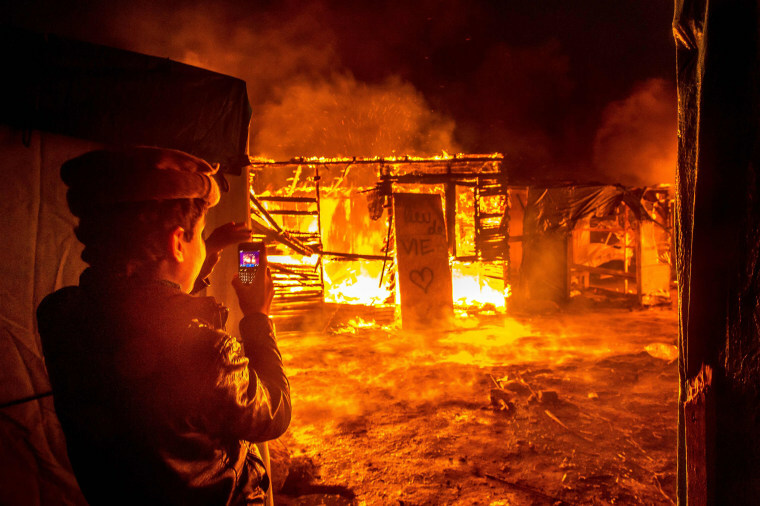 A young Afghan migrant films burning shacks and a placard reading "living space", in the southern part of the "Jungle" migrant camp, as half of the camp is dismantled by French authorities in Calais, on March 1. 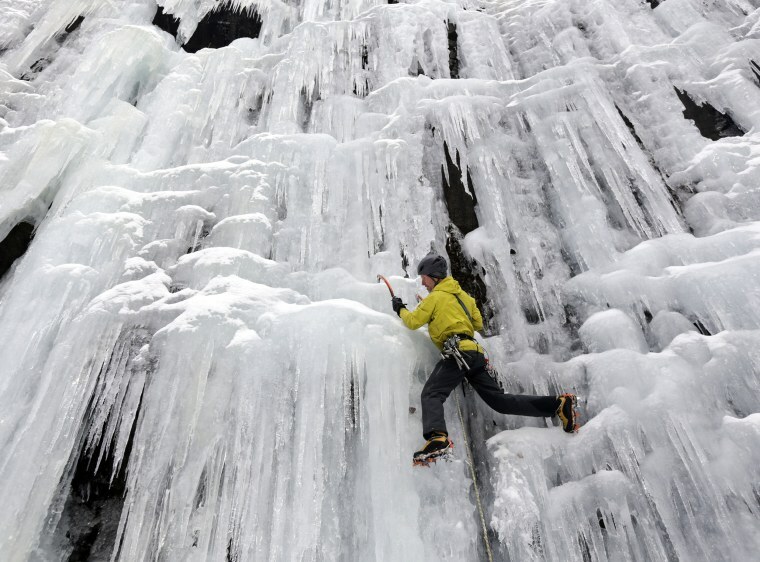 Ice climber Don Mellor climbs Pitchoff Quarry in Keene, N.Y. Mellor began ice climbing in the make-your-own tools era and has since introduced the sport to generations of students at a Lake Placid prep school where he is a teacher and counselor. This photo was taken on Feb. 10, but made available to NBC News this week. Women enjoy sunbathing at the wall of the Peter and Paul fortress in St. Petersburg, Russia on March 1. 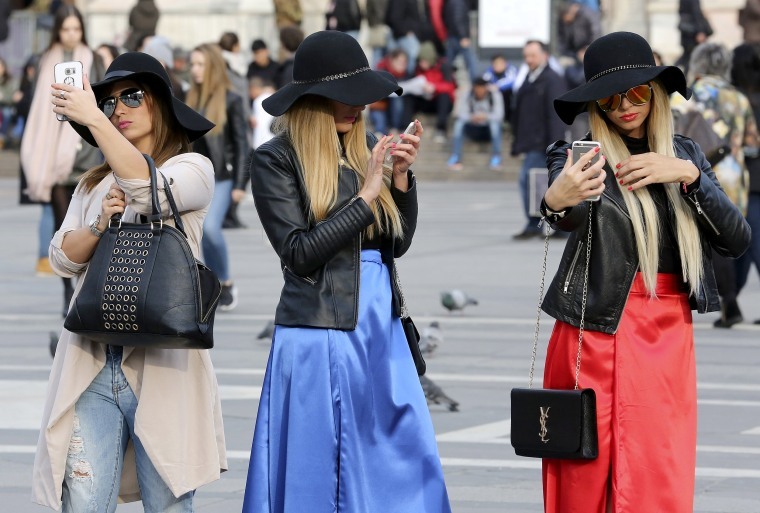 Women use their mobile phones in Duomo Square in downtown Milan, Italy on Feb. 25. 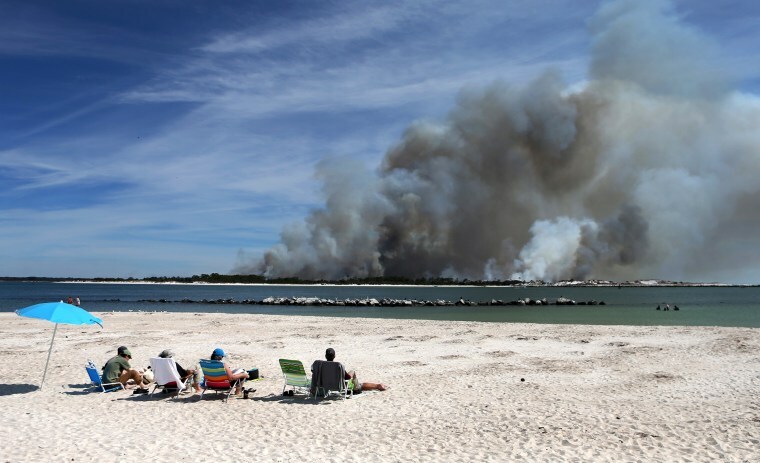 Beach goers enjoy themselves at St. Andrews State Park in Panama City Beach, Fla. as a controlled fire releases smoke over Shell Island on March 2. 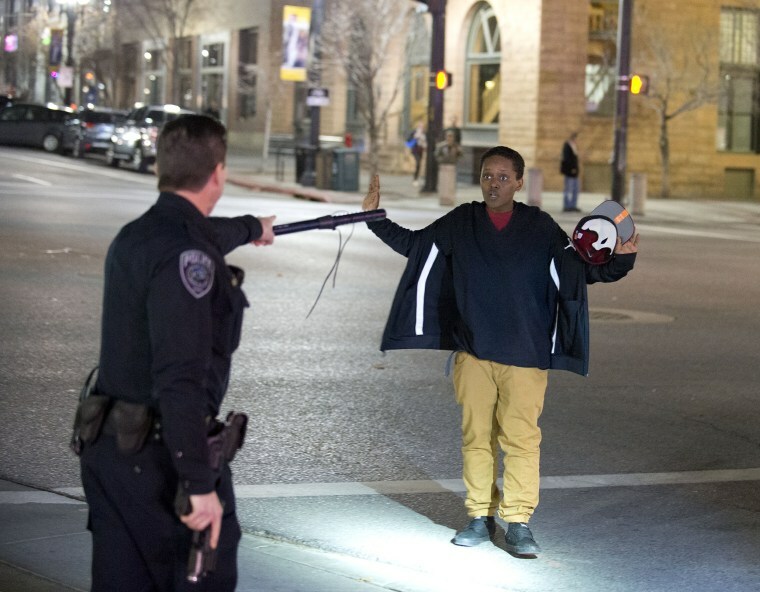 Police stop a boy as he walks away from a crowd that formed after an officer-involved shooting in Salt Lake City, Feb. 27. Unrest broke out in a Salt Lake City neighborhood on Saturday night after what appears to be a shooting involving a police officer, the Salt Lake Tribune reported. 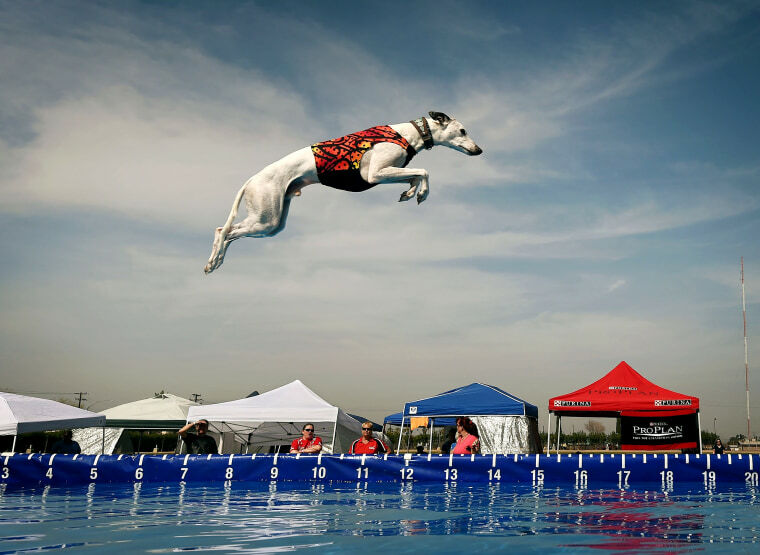 World record holder 'Cochiti' the Whippet leaps into the water to record the distance of his jump during the Dock Dogs West Coast Challenge in Bakersfield, Calif. on Feb. 26. 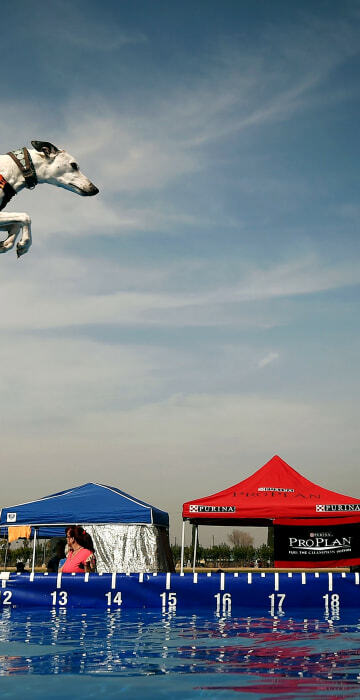 Dock Diving is a sport where agile dogs compete for prizes by jumping for distance from a dock into a pool of water. 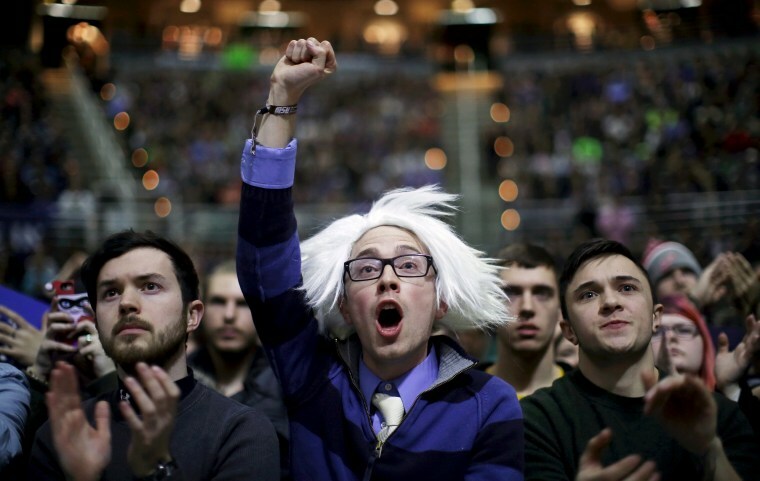 Supporters cheer at a campaign rally for U.S. Democratic presidential candidate Bernie Sanders in East Lansing, Michigan, March 2. 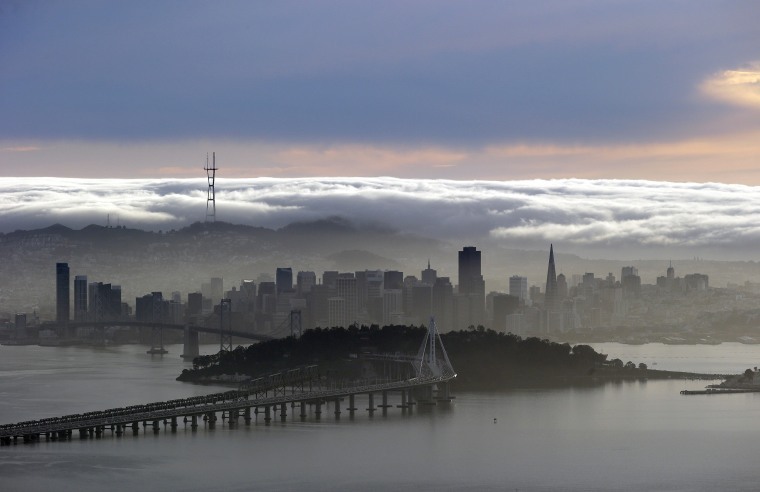 A blanket of fog covers the San Francisco skyline in a view from the Berkeley Hills, Feb. 28, in Berkeley, Calif.